I usually feature 2 or 3 cats at once, but today this boy gets a whole page to himself for several reasons. 1) He is very handsome and photogenic. 2) He was very calm and cooperative. 3) Right now I don't have any other pictures of adult cats to put him with! This is Denny, a medium-haired buff tabby. He is approximately 1-2 years old and has only been at the Humane Society of Noble County for a little over a week. He is up-to-date on shots, flea prevention, and worming. Denny is an EXTREMELY sweet boy. He is curious and likes to explore, but he is very calm and laid back. He loves attention and might be a great lap cat because he seems pretty cuddly. 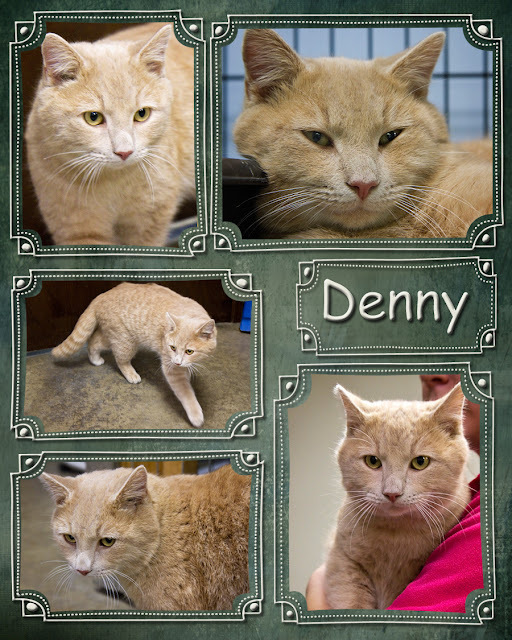 Please come to the shelter to visit Denny and see if you could give him his much-deserved forever home! These babies were all born at the Humane Society of Noble County on 9-02-15, making them just shy of 3 months old. They are all up-to-date on shots, worming, and flea prevention. The first guy is Brendan. He is a long-haired white and orange male. He is probably blind in one eye, but that doesn't slow him down for a minute. He is very active and playful, and he loves attention! Next is Penelope, a black, tan, and white female with tabby markings. She is curious and playful, as well as very friendly with people and other cats. The last one is Belle, a female who is white and orange with a few black patches. In the first picture, you can see one of the little black patches on her back. She is also playful and loving. All of the cats and dogs at the shelter would make great pets! 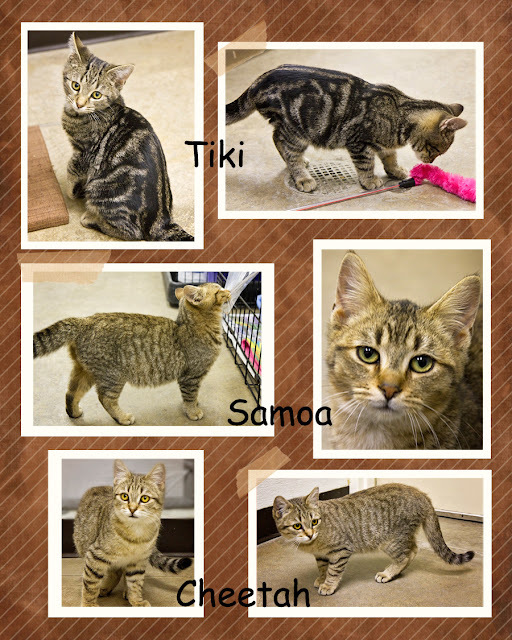 Come visit them and see if you could give one (or several) of them their forever home! Both of these girls and available for adoption from the Humane Society of Noble County. They are up-to-date on shots and have been wormed. On the left is Winnie, a short-haired white, black, and silver cat with some tabby markings, including her stripes and the M on her forehead. Winnie is 8-10 months old and has only been at the shelter for a few days. She is curious, likes to explore, and is very friendly. On the right is Gracie, a short-haired gray cat with gorgeous eyes! She is approximately 10-12 months old and has been at the shelter for about a week. Gracie is very affectionate and loves to be held and petted. These cats and many other animals are awaiting their forever homes. Please come to the shelter to visit! 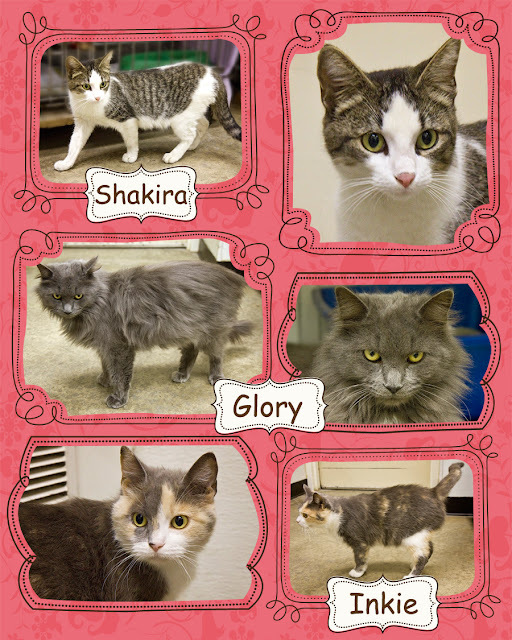 Here are three more beautiful female cats who are available for adoption from the Humane Society of Noble County. They are all up-to-date on shots, worming, and flea prevention. Misty is a gorgeous dilute calico, 2-3 years old, who has been at the shelter for about a week. She is a little shy as she gets used to her new surroundings, but she is friendly and likes human attention. Sadie is a medium-haired black cat with white paws and chest. She is front declawed. She is approximately 4 years old and has been at the shelter for about 2 weeks. Sadie is also a little shy, but she is very cuddly. Mallory is a long-haired gray, tan, and orange cat who is 2-4 years old. She has been at the shelter since August. She gave birth to a litter of kittens after she was brought in, and is now ready for her forever home. Mallory is playful and loves attention! Come to the shelter to see all of the great cats and dogs, and choose one or two to be yours! Here are three cats in various degrees of black and white. They are available for adoption from the Humane Society of Noble County. All three have had shots and flea prevention and have been wormed. Zoey is mostly white with some black spots. She is 3-4 years old and has been at the shelter for a little over a week. She is a real sweetheart with people and gets along well with other cats. CoCo is all black with a few white hairs if you look real closely. She is 2-3 years old and has been at the shelter since mid-August. CoCo is a little shy, but she is very loving and wants a lot of human attention. Skylar is mostly black, with white feet, chest, throat, and belly. She is only 7-9 months old and has been at the shelter for about a week. She gets along well with other cats, is very curious, and loves attention. Please come to the shelter to visit these cats and the many other cats and dogs who are waiting for their forever homes! 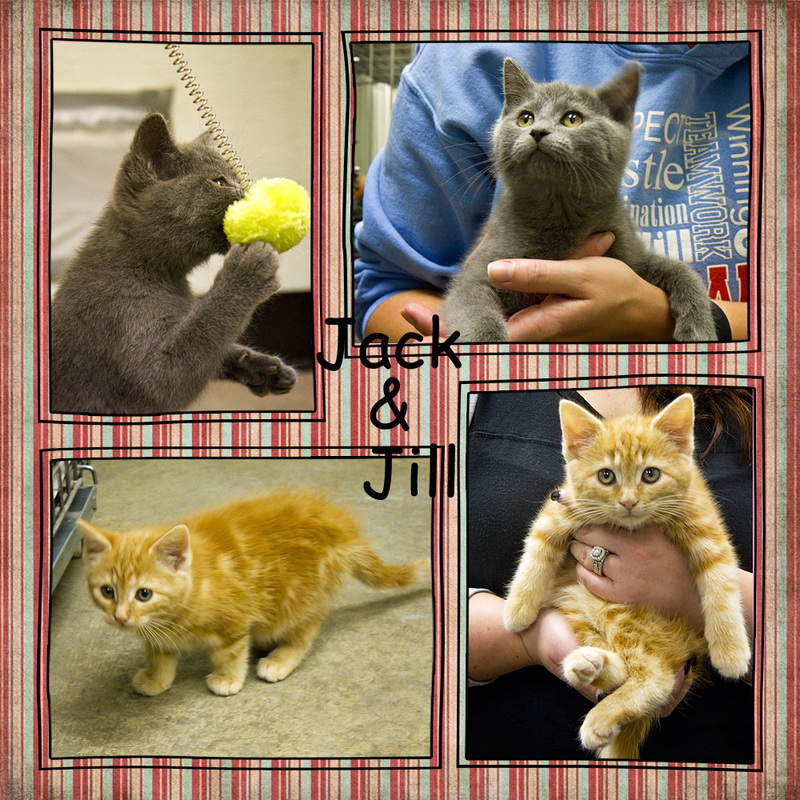 Today's featured kitties are Jack and Jill. They are both around 3 months old and are up-to-date on shots, flea prevention, and worming. They are available for adoption from the Humane Society of Noble County, where they have been for a little over a week. Jack is a gray male with pretty gold eyes. He is very playful and loves human attention. He is also friendly and playful with other cats. Jill is an orange and buff tabby female. She is very affectionate and has a purr that you could hear a mile away! She is also friendly with other cats. These cats and many other animals are waiting for their forever homes. Please come to the shelter to visit all of the animals! Today's cats are 3 very different females. All three are available for adoption from the Humane Society of Noble County. They are all up-to-date on shots, flea prevention, and worming. The first cat is Shakira, who has black and tan tabby markings with a lot of white. She is 1-2 years old and has been at the shelter for 2-3 weeks. She wants attention, but is still adjusting to the shelter and is a little shy around people and other cats. She just needs someone who would give her a loving home! Next is Glory, a long-haired gray beauty with a few white chest hairs. She is probably 3-4 years old and came to the shelter about 4 weeks ago. These pictures make her look a little haughty, but she loves attention! The last cat is Inkie, a dilute calico with 4 white paws. She is 2-3 years old and has been at the shelter since the end of October. She is very loving and cuddly and would love to be your lap cat! Please come to the shelter to visit all of the dogs and cats, and take a few to their new forever homes! These three young tabby cats are available for adoption from the Humane Society of Noble County. They are all up-to-date on shots, flea prevention, and worming and are all new residents at the shelter. First is Tiki, a black and tan male tabby with a definite bulls-eye pattern on his sides. He is 4-6 months old, and has been at the shelter for a little over two weeks. Tiki is curious, but also very affectionate and loves to be held and cuddled. Samoa and Cheetah look a lot alike. Samoa is a brown and tan male who is 4-6 months old. He has been at the shelter for about 3 weeks. He is curious, likes to explore, and loves attention. Cheetah is a black and tan male who is 7-8 months old, so he is slightly bigger than Samoa. Otherwise, their markings and coloring are so similar, it is hard to tell them apart. Cheetah has been at the shelter for 2-3 weeks. He is curious and loves to be petted and cuddled. All three of these cats would love for you to visit them at the shelter. They are waiting for loving, forever homes, as are many other cats and dogs who would make great pets! No - this is not four pictures of the same cat. Two are Colton and two are Pumpkin. They are both available for adoption from the Humane Society of Noble County. Both have been wormed and are up-to-date on shots and flea prevention. Colton is a male buff-colored tabby who is 6-7 months old. He is an explorer and loves to play. He is also friendly and likes attention. He has been at the shelter since spring. 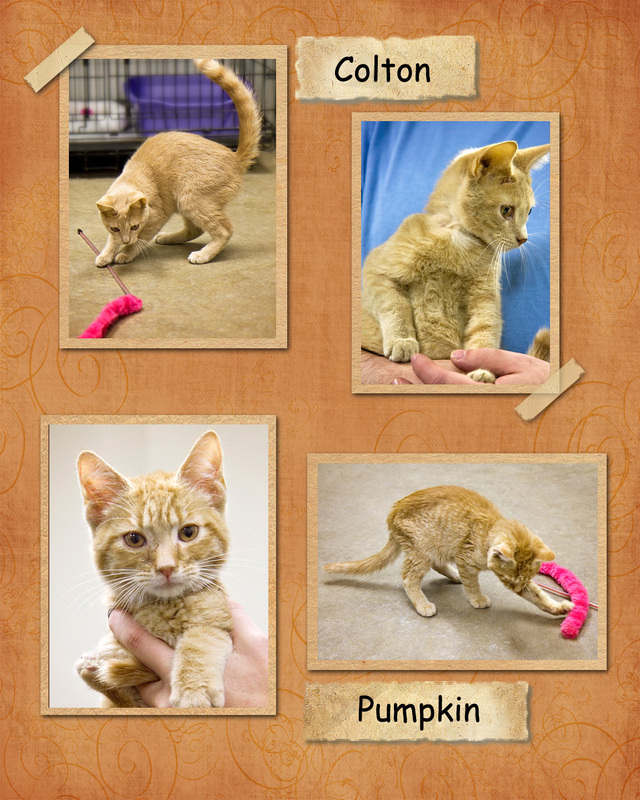 Pumpkin is an orange male tabby with some white markings. If you look closely, you will see that he has white around his mouth and eyes which Colton does not have. Pumpkin is 4-5 months old. He has been at the shelter since mid-October. He is also very playful and loving. You can see that he and Colton like the same toy! Come to the shelter to visit these two and the many other great animals there! 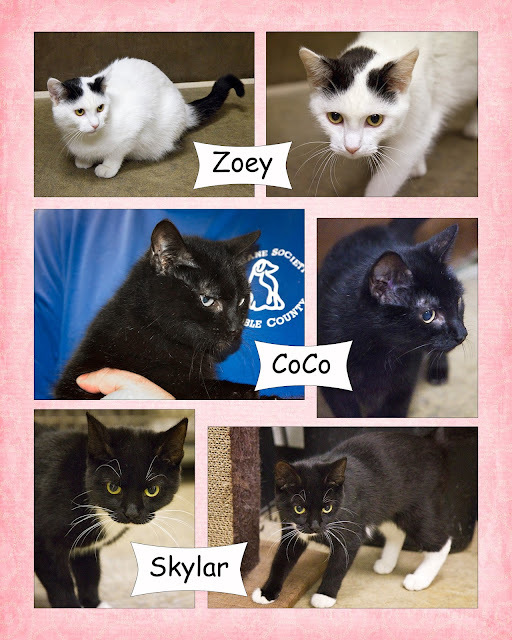 These three black and white cats are available for adoption from the Humane Society of Noble County. They are all up-to-date on shots, worming, and flea prevention. Chelsea and Tessie look quite a bit alike, but you can tell the difference by their noses. Chelsea's nose is black and Tessie's is white. Chelsea is a female who is 1-2 years old. She has been at the shelter for a little over 3 weeks. She is shy, but is also curious and friendly. 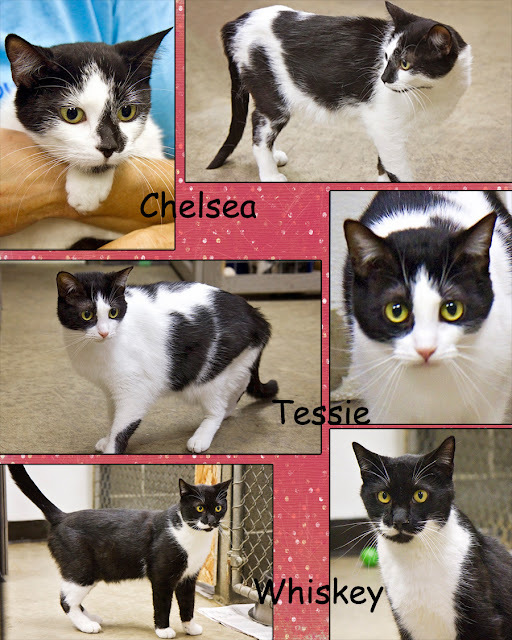 Tessie is a female who is front declawed. She is approximately 3-4 years old and has been at the shelter for around 2 months. She is also curious and friendly, but a little shy. On one side, she has a black spot that looks like a heart! Whiskey is a neutered male who is black with white spots. He is 8-9 years old and has been at the shelter for 2-3 weeks. He likes to explore and likes attention. Because he's an older boy, he's pretty calm. Please come to the shelter to visit these cats and all the other wonderful animals there. You will find someone you love! Here are three tabby cats who are available for adoption from the Humane Society of Noble County. If you don't look closely, they all look quite a bit alike, but they do have distinguishing characteristics. All three are up-to-date on shots, flea prevention, and worming. Martika is a black and tan female tabby who is 1-2 years old. One of her distinguishing markings is the bulls-eye pattern on her sides.She is very curious and loves attention. She has only been at the shelter for a couple of weeks, and is looking forward to finding a new home. Binx is a brown and tan male tabby, also approximately 1-2 years old. He likes to explore and is very friendly. He has only been at the shelter for about a week. He gets along well with all the other cats. 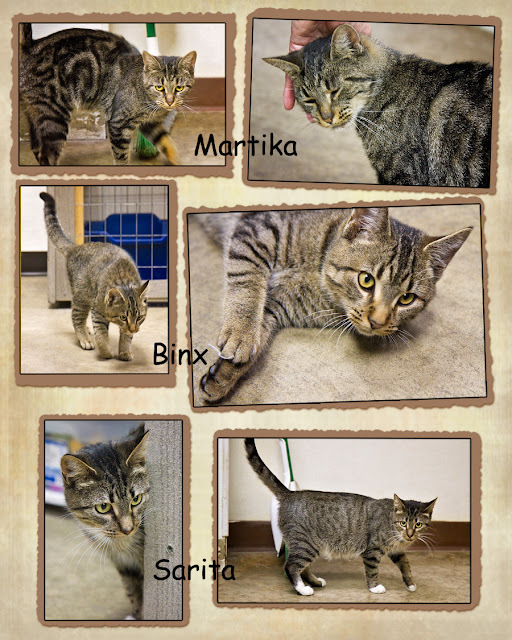 Sarita is a tan and black female tabby with white paws and some white on her neck and chest. She is 2-3 years old and has been at the shelter for 3 months. She is FIV-negative, and would love to find her forever home. She is friendly and loving. 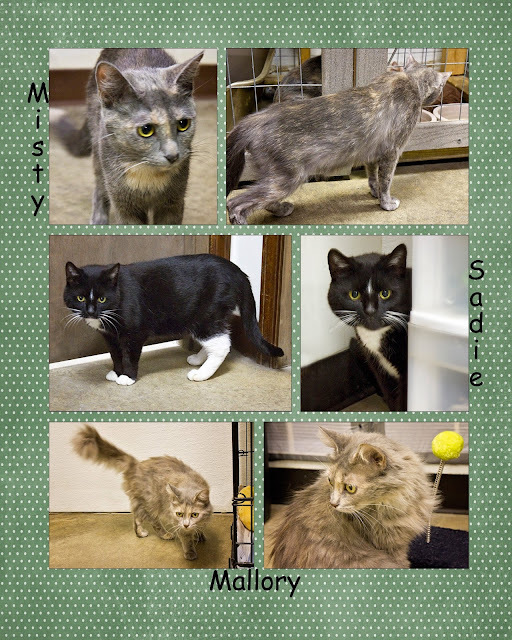 These and many other fantastic cats, kittens, and dogs (and a ferret) are waiting for you to visit them at the Humane Society of Noble County. If you can't give an animal a good home, maybe you know someone who can. These animals deserve the best! !